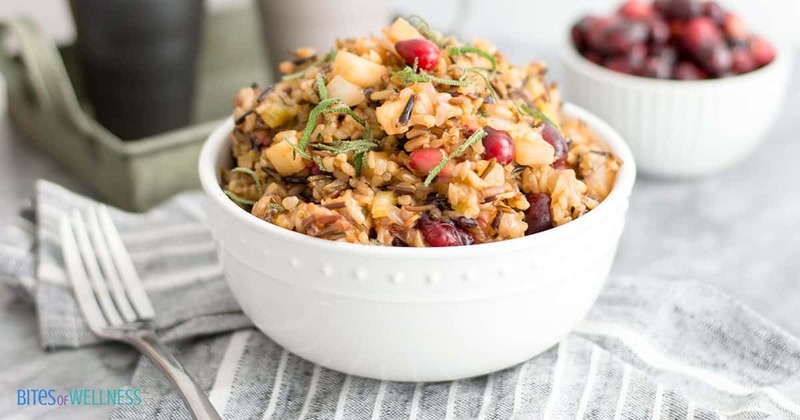 Wild Rice Stuffing is the perfect addition to your dinner or weeknight meal. 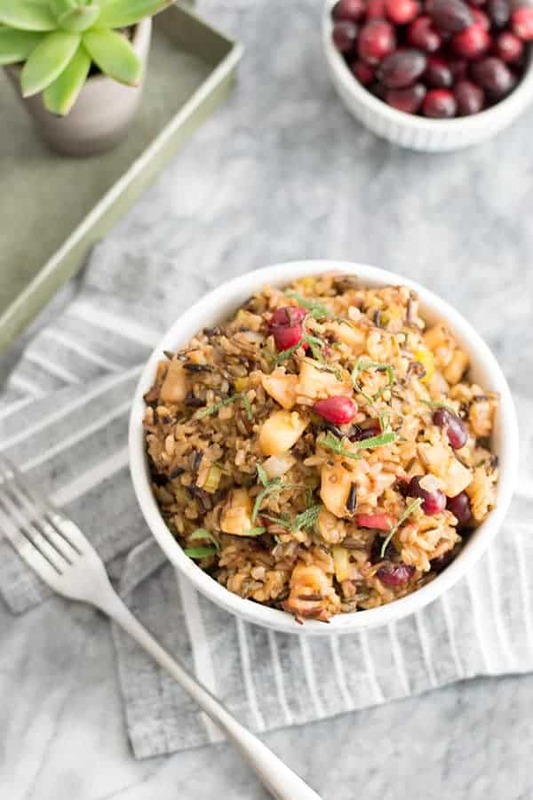 It’s super simple and full of fall flavors! It’s gluten free and vegetarian! November is just flying by. I’m already trying to figure out what I want to make for Thanksgiving this year. We have a fun Friendsgiving the weekend before Thanksgiving and I’d love to bring a stellar dish or two. Not to mention cooking for Thanksgiving. This wild rice stuffing is making me give the typical stuffing a serious side eye. Fresh food made with love and some extra special touches really makes it feel like the holidays for me. Every year I try so hard to love stuffing. But in all honesty, its usually dry, bland, too mushy, or overly complicated. Am I alone? Well short of making Stove Top Stuffing (which is not going to happen – have you seen the ingredient list?) I decided to try out a whole new approach to stuffing; wild rice! It’s pretty genius – no oven, can be made ahead of time, and really versatile! 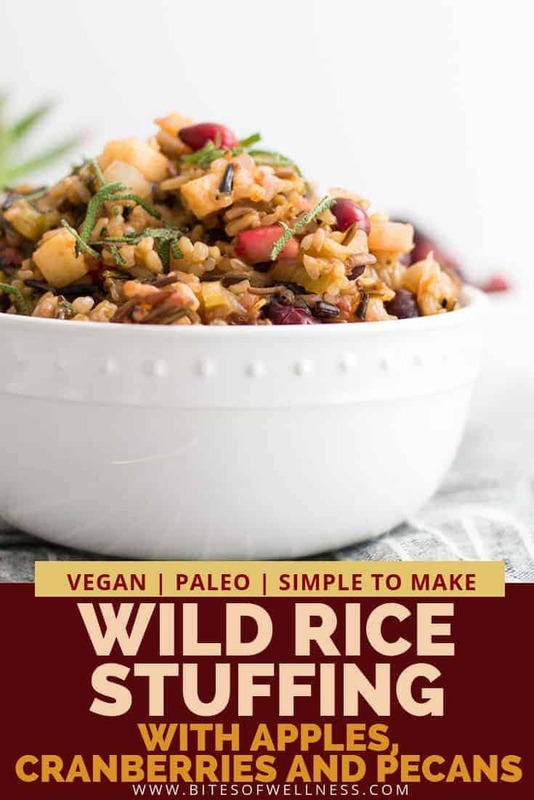 My step dad, Dave and I all are pretty sensitive to gluten so using wild rice is an added bonus – it’s gluten free! Want more gluten free and whole foods recipes Thanksgiving recipes? 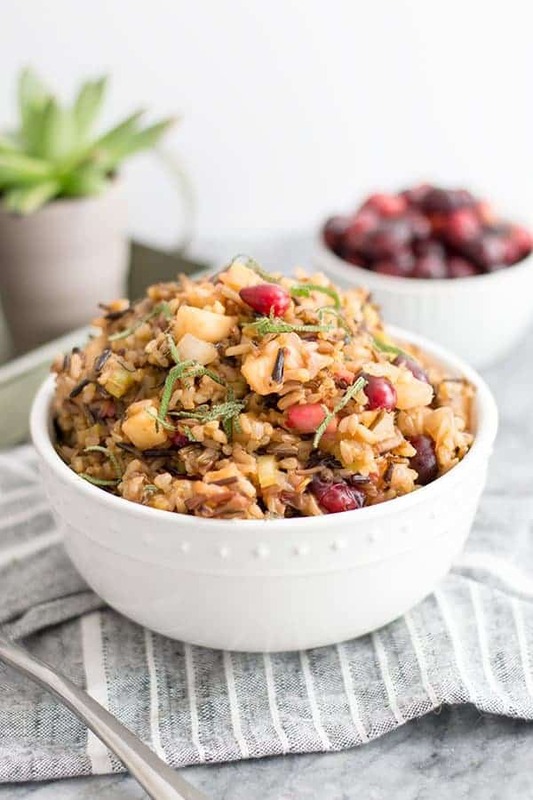 Make sure to check out the Orange Ginger Cranberry Sauce with no added sugar, it’s so good! As I was making this recipe, I asked Dave what he would like to have in stuffing this year. He replied “I don’t know but I want it to be CRUNCHY”! Apparently mushy stuffing is his pet peeve. 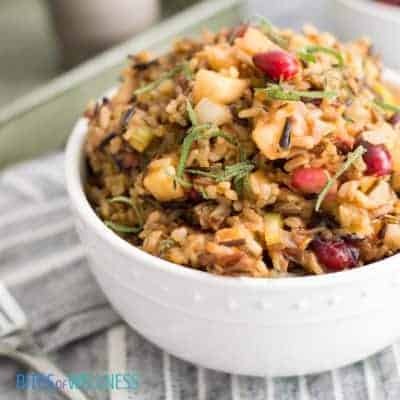 I like the contrast of apples and cranberries, the sweetness from the apples and the tart bite from the cranberries perfectly balances out the dish for me. To make sure there was enough “crunch” in this dish, I added chopped pecans as well. This was a last minute addition but it makes the dish if you ask me and I wouldn’t leave them out unless you really don’t like them. Who doesn’t like pecans?? 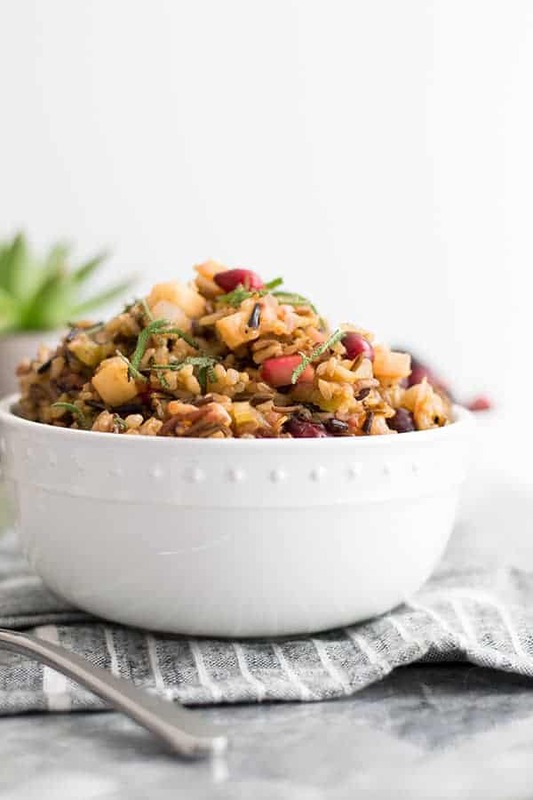 See how easy the Wild Rice Stuffing is to make in the video below! In a large pot, combine the wild rice, water, vegetable stock, 4 sage leaves, rosemary and dried bay leaf in a pot. Bring the water to a boil and turn the heat down to medium low. Cover and cook 30 minutes, stirring occasionally. 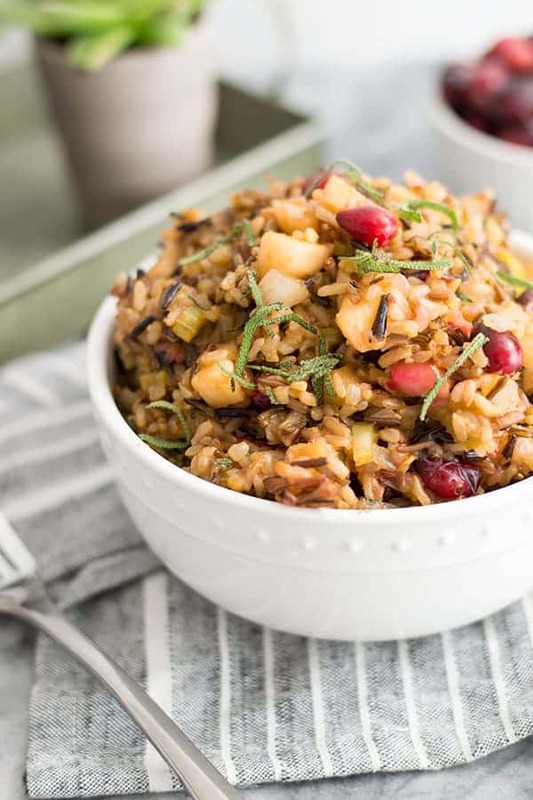 Prepare the onion, celery, apple and cranberries as the rice is cooking. With 10 minutes left, spray the pan with non-stick spray and saute' over medium heat. Add onions, celery and salt and cook 2-3 minutes. Add apples and cranberries to the onion and celery mixture. Cook 3-4 minutes and then add maple syrup and cook an additional 1-2 minutes over medium heat. Note: If you notice the onions and celery starting to stick to the pan, you can add a little vegetable stock. Once the rice is done, transfer it to a large bowl. Add the vegetable mixture and stir to combine. Add 1/4 cup chopped pecans. For presentation I highly recommend adding a few whole cranberries, some sage leaves, and whole pecans. It really makes the dish pop! Just make sure the sage leaves don’t get eaten whole (bleh!). If you’re looking to add an easy turkey recipe to go along side this stuffing make sure to check out this slow cooker turkey breast! Do you have a Friendsgiving or something of the sort? Crunchy stuffing or soft stuffing? Do you have a Thanksgiving food that you try to love but just can’t? Thanks so much for linking up and sharing this recipe for Thanksgiving. We don’t always remember some family and friends are GF or Vegetarian. I have shared on FB and pinned. Thanks for linking up to #BloggersPitStop and Happy Thanksgiving. Thanks Sue! Love everything you do. See you next week! Your Video is great and the Wild Rice Stuffing looks fantastic! Thanks so much for sharing with us at Full Plate Thursday. Come to next weeks Thanksgiving party on Tuesday at 8:00 am, CST, see you then! all your photos of this dish actually look as tho you used a rice blend (wild and brown maybe? )…please let me know as the recipe looks delish! I’ve actually never had fresh cranberries! Do they taste like the dried ones or is their taste less sweet/more mild? This looks lovely! Perfect for Thanksgiving as a side dish. Thanks Lauren! I can’t wait to share it with my family! Have a great day girl!